Short Term Outcome of Laparoscopic Total Mesorectal Excision in Low Rectal Cancer Following Neoadjuvant Chemoradiation. 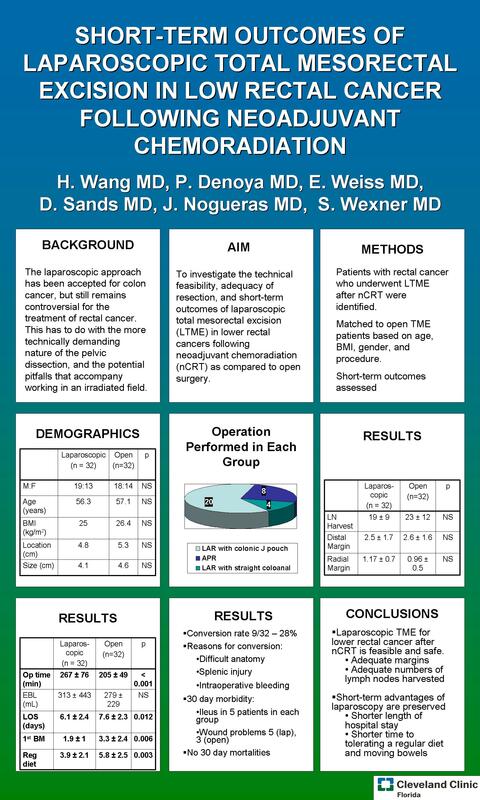 Objective: To investigate the feasibility of laparoscopic total mesorectal excision (TME) in mid-lower rectal cancers following neoadjuvant chemoradiation (nCRT). Summary Background data: The laparoscopic approach for colon cancer has been widely accepted. A few studies have shown that there are advantages of laparoscopic over open TME surgery for rectal cancer. However, the role of laparoscopy has not been clearly defined specifically in cases following nCRT. Methods: All patients with rectal cancer who underwent nCRT were identified; no operations for rectal carcinoma were performed laparoscopically prior to 2005. The laparoscopic cases were matched to open cases based on gender, procedure, age and BMI. The medical records were reviewed and short term outcome was compared between these two groups. Statistical analysis was performed using SPSS© 15 software.